Here’s another guest post by Terry Nakazono (his first is here). Enjoy! In a few posts (and one Cloudy Nights article), Matt made mention of getting his start in observational astronomy after a visit to Lick Observatory in San Jose, California and looking through the Great Lick Refractor. The term “Great Refractor” refers to an achromatic refracting refractor that is the largest in a region, or in the world. When it was completed in 1888, the Lick refractor was the biggest (36-inch lens) in the world. 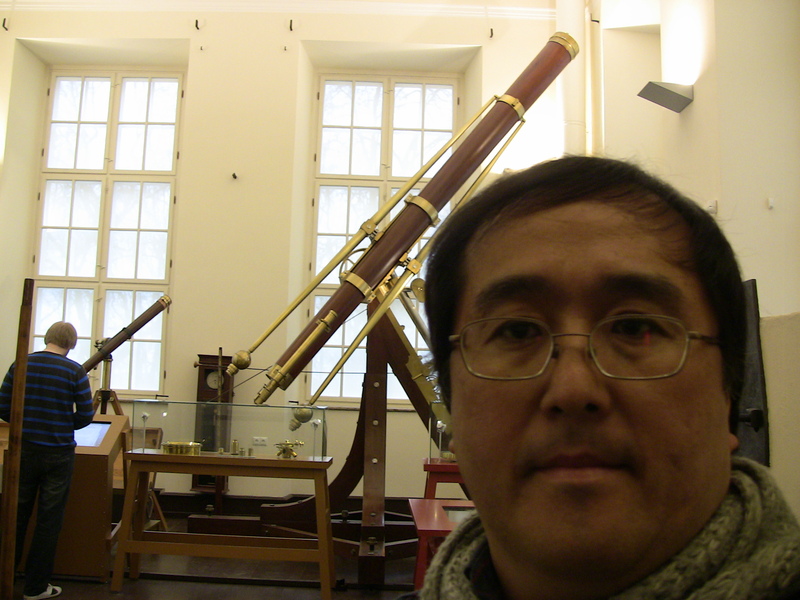 Hence the term the “Great Lick Refractor”.Earlier in April this year, I made a visit to the Old Tartu Observatory in Tartu (Estonia), built between the years 1808-1810 and now a museum. 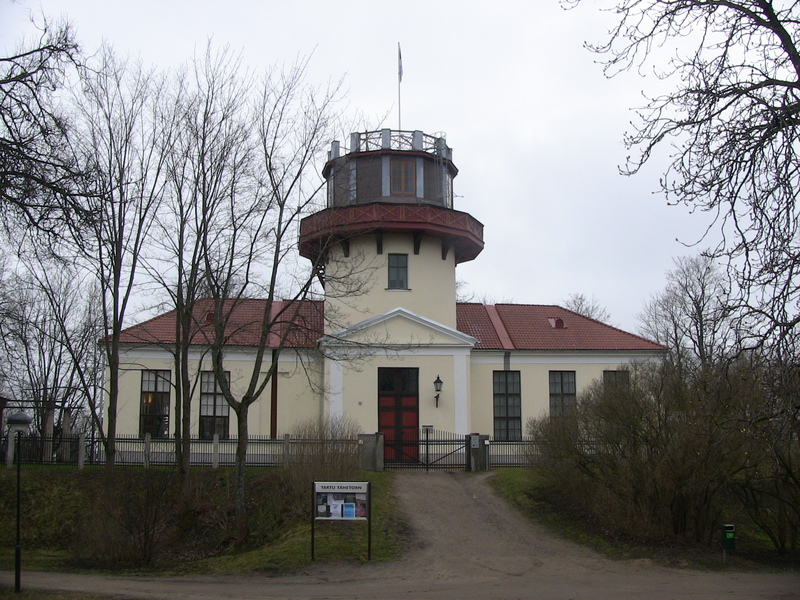 This observatory houses the first “Great Refractor” – the Great Dorpat Refractor (Dorpat is the old German name for Tartu), built by the noted German optician Joseph Fraunhofer in 1824 (also known as the Fraunhofer Refractor). 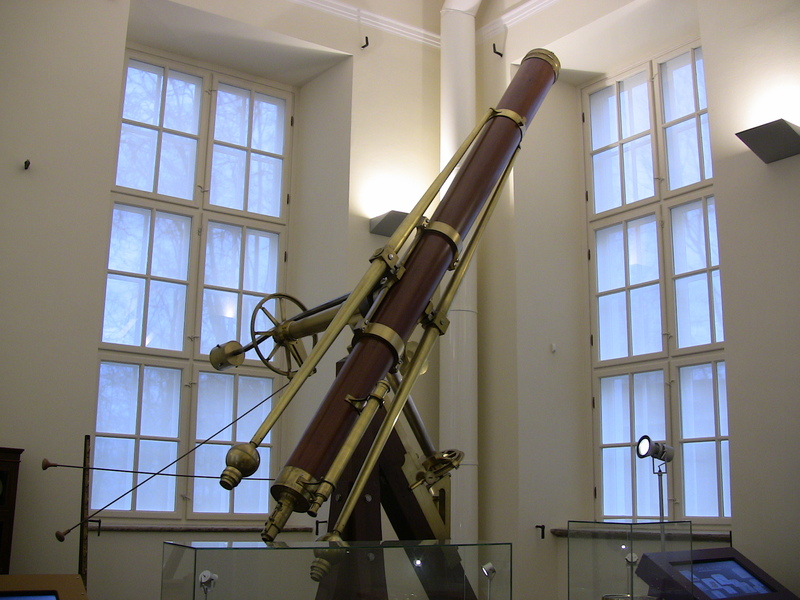 This telescope was the forerunner of the Lick and other large refractors built in the 19th and 20th centuries. This 9.6 inch (24cm) achromat with a focal ratio of 16.6 was the largest and best refractor in the world for many years. The lens had a light-gathering capacity equal to a reflector of that era having twice the aperture of this refractor. 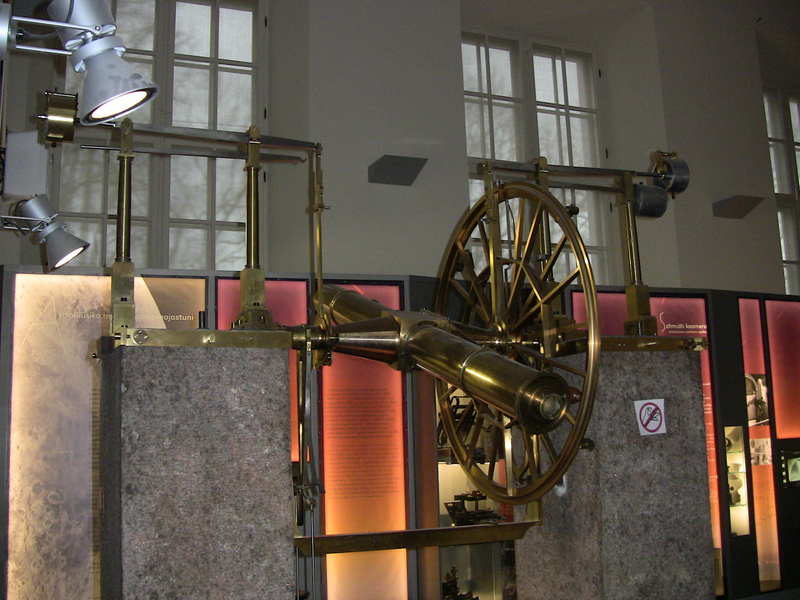 This was also the first telescope to use a German equatorial mount, with a precision clock drive that allowed objects to be tracked automatically. 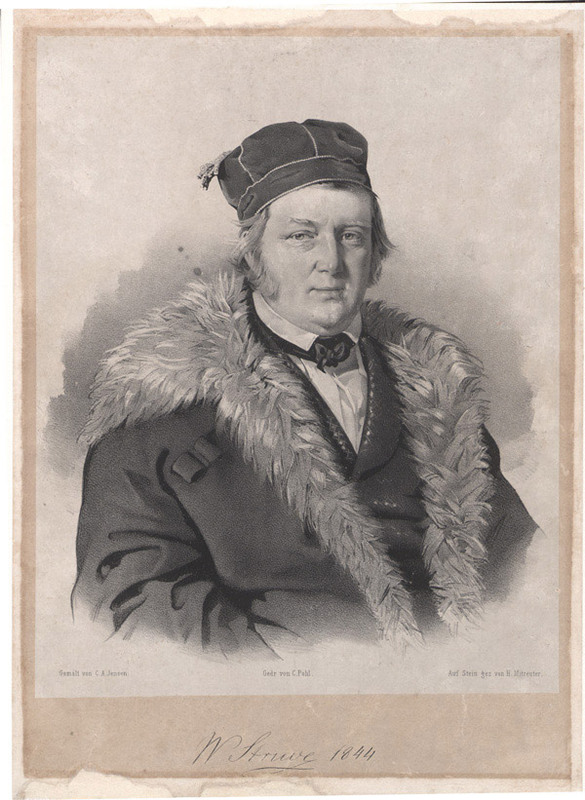 The man who ordered this telescope from Fraunhofer was Friedrich Georg Wilhelm Struve, the director of the observatory from 1820-1839. His most famous observations with this refractor included a massive survey of double stars (whereby he published two double star catalogs), the measurement of the parallax of Vega in 1837, measurements of the diameters of Jupiter’s 4 largest satellites in 1826 (which turned out to be the most accurate for the next century), and Halley’s comet in 1835, where he measured the dimensions of the tail and was able to see the nucleus of the comet. 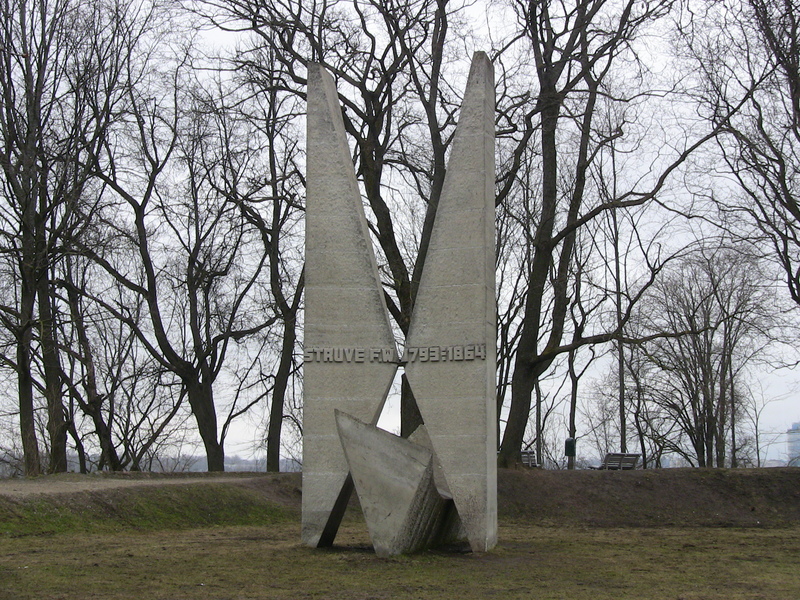 On the observatory grounds is a monument to Struve. On display at the observatory are many other instruments used by Struve and others. 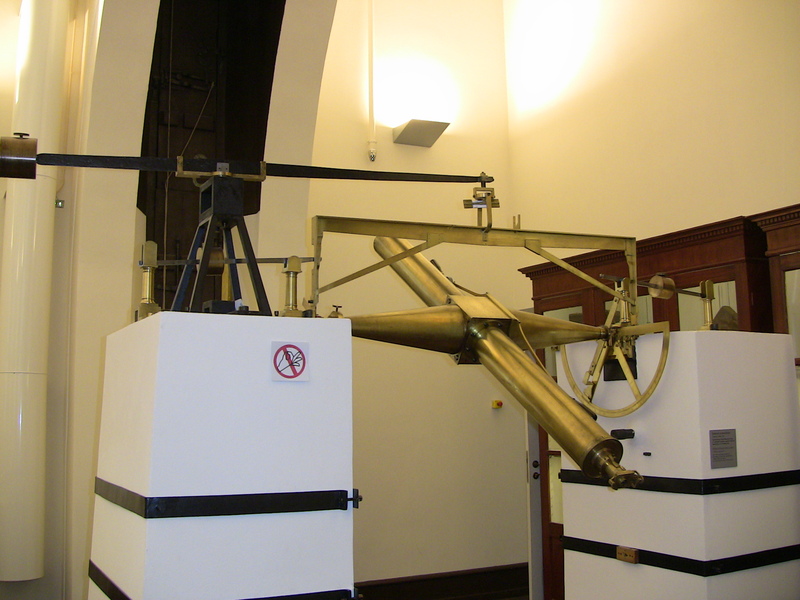 One is the Dollond transit instrument (purchased in 1807), used to determine exact astronomical coordinates. Another instrument used to measure the position of stars was the Reichenback-Ertel Meridian Circle (purchased in 1822). The Troughton telescope (purchased in 1807) was a 3.5 inch achromat that was Struve’s main observational instrument before the Fraunhofer refractor. 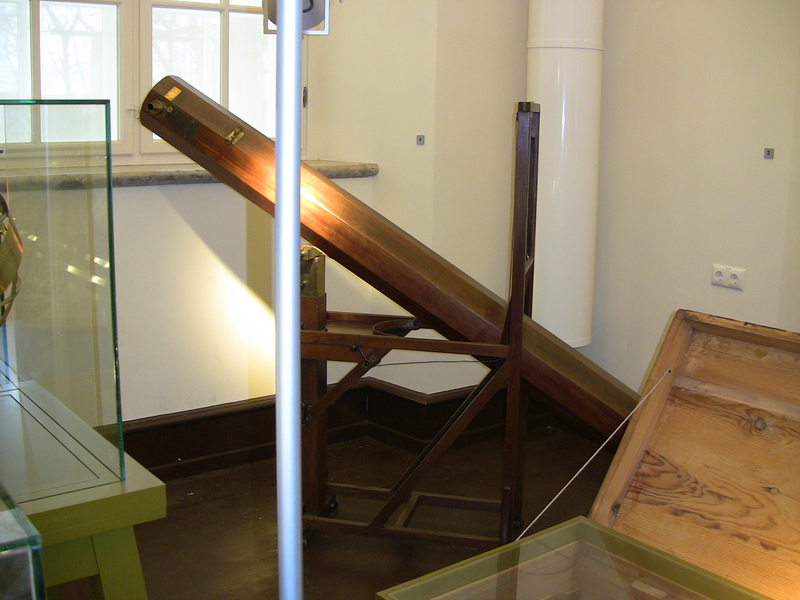 But the most fascinating item on display (besides the Fraunhofer scope) is the Herschel 7-foot refractor, bought in 1806. Herschel made 200 of these 7-foot scopes between 1778 and 1820, out of which only 21 have survived today. 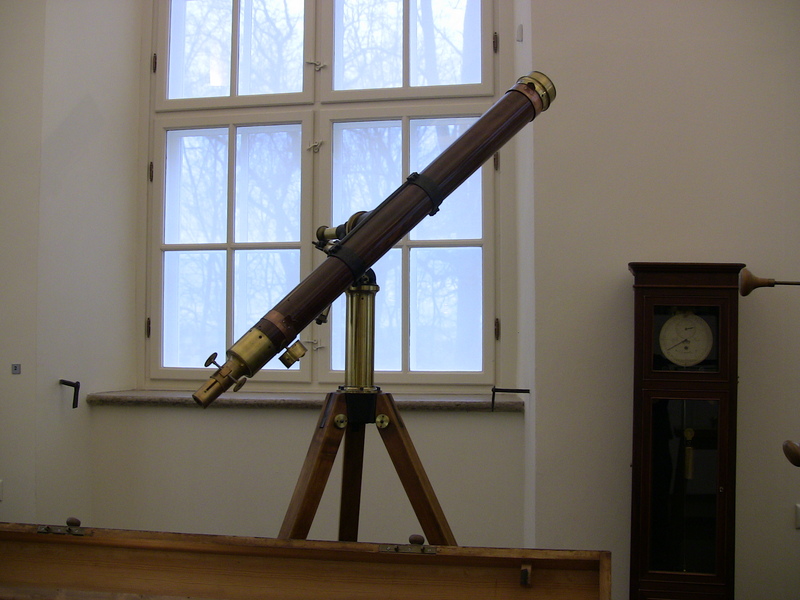 It was with one of these scopes that he discovered Uranus in 1781. The aperture of the Herschel 7-foot scope was 160mm, or 6.3 inches. Reflectors of that era were made of speculum metal, which tarnished easily and reflected only 66% of the light that hit it. During the pre-Fraunhofer refractor days, it was easier for Struve to use the Troughton 3.5 inch refractor as his main observing scope, since it was much more portable and probably matched, if not exceeded, the light-gathering capability of the Herschel reflector. Consequently, the Herschel scope was used mainly for observing the occultation of stars by the Moon. There were two Tartu University students working in the observatory (one worked the front desk and the other was letting visitors in and out of rooms]. Unfortunately, they were neither astronomy nor science majors and could not answer any of my questions regarding the Fraunhofer and other instruments. 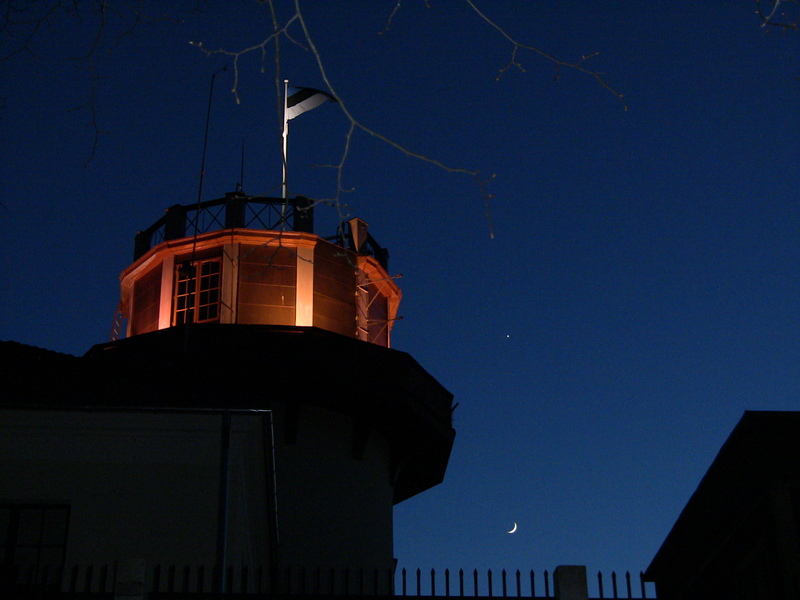 Here is a picture of the dome of the observatory at night – you can see the moon and Venus next to it. 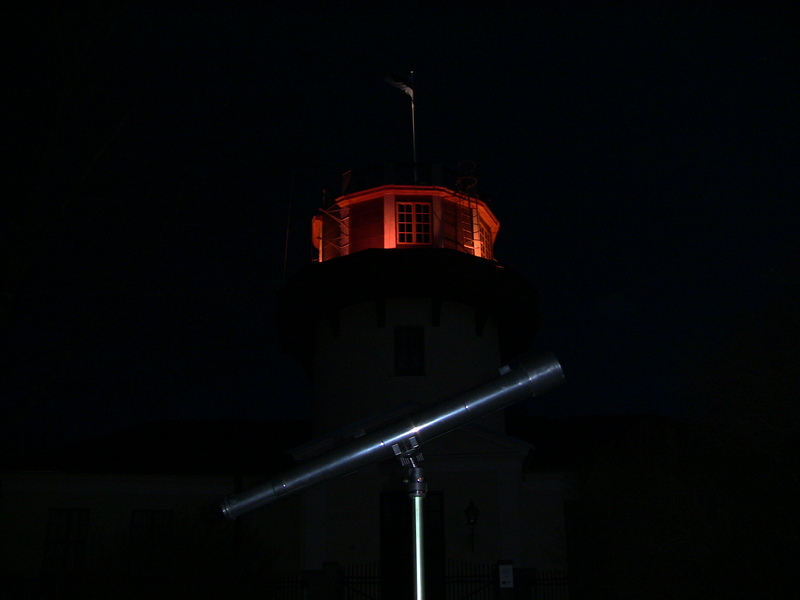 This next picture shows my Galileoscope 2-inch achromat refractor in front of the entrance to the observatory. Looking forward to visiting other historic observatories, including the ones closer to home (e.g. Lick, Mt. Wilson, Palomar). Thanks for the posting such an interesting and well done article. Also, just read your post about visiting the Lick observatory, very nice. I’ve had some great views of Saturn through my 15″ Obsession, but would love to view it through a mega refractor!